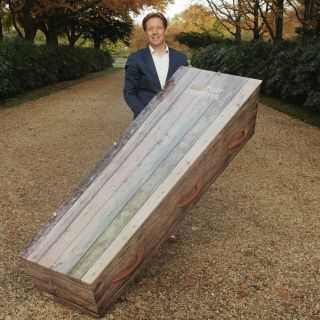 FAIR coffins is a social enterprise. FAIR coffins wants to contribute towards a new economy that is circular, inclusive and free of poverty. Solving issues within society is at the heart of our company. At FAIR coffins we think of profit as a means to achieve our social and environmental goals. Profit or profit maximisation in itself is not one our goals. This is why FAIR coffins has committed to a restrained renumeration policy ad has included this in the statutory provisions. At least 50% of the profits are re-invested within the company itself. Impact first! 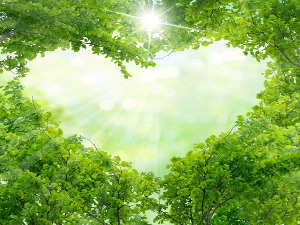 FAIR coffins wants to protect and preserve the earth and existing nature for present and future generations by the development, production and sale of fully eco-friendly & carbon neutral coffins and caskets made from recycled and biodegradable materials. 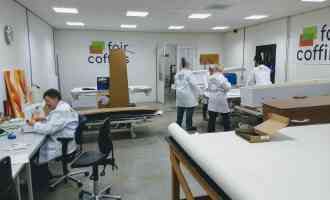 FAIR coffins feels that companies – being entities within society – also have a social responsibility. For this reason FAIR coffins finds it important to have it as one of its goals to provide jobs to people with a disability or people who have disadvantages on the labour market and thereby offer them the possibility of sustainable employment, education and personal development. We aim for a workforce that consists of 70% of permanent employees, of whom ¾ has found their job with us through guided projects and 30% of employees who work with us as part of their learning-working path. HHow do we achieve these goals? FAIR coffins are available for the same low price as a conventional, polluting coffin or casket made of chipboard. This ensures that customers can choose an eco-friendly coffin without having to pay extra. Because our coffins are so affordable, we aspire to grow fast, thereby creating a larger positive impact on the environment and increasing our ability to offer jobs to people with a disability or a disadvantage on the labour market. FAIR coffins endorses the principles of sustainable entrepreneurship and corporate social responsibility (ISO 26000) and considers itself a social enterprise, ensuring that we will always aim for finding the right balance between people, planet and profit. With your help we will make a contribution together towards a cleaner world in which everyone is able to participate, no matter their background or whether they have a disability or not. Make a conscious decision, choose FAIR coffins. We are happy to further discuss the possibilities with you!